We refinish all wood chancel furnishings, including clergy seating and pulpits. Our craftsmen can also refinish your existing millwork and woodwork. Church Interiors provides complete church furniture refinishing services. We provide you the same quality as the manufacturer, but the cost is much less than it would be for new church chairs, pulpits, pews, and courtroom benches. Your furniture is disassembled and transported to our refinishing facility by our craftsmen. Original solid wood furniture in many churches has historical significance. Having the original furniture restored preserves the historical integrity of the church sanctuary. Our process is quick and cost effective, as our craftsmen have perfected it. Prior to the refinishing process, the existing church furniture will be chemically cleaned on-site. The process our craftsmen use is meticulous and involves several steps up until the final coat of polyurethane is applied to the surface. 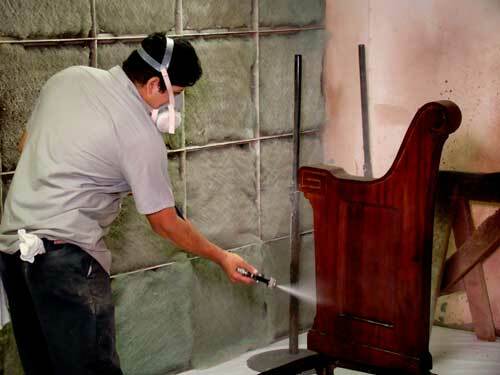 The result is a new permanent finish that serves your chancel furniture and pews, pulpits, church chairs, and courtroom benches well by protecting and preserving them. There are limitations to light refinishing church chairs, pews, pulpits, and courtroom benches. This process is not appropriate for pews with sunlight damage, water damage, or excessive scratches. The stain color cannot be changed by light refinishing. However, the benefit of light refinishing is that it is a cost effective way to extend the life of your furniture and enhance their existing appearance. This is a permanent process that can be completed on-site without interrupting church services.